To better understand the work of the Maître de Chai, here’s an immersion course in our cellar. As summer ends, we prepare the cellar to welcome the new harvest. Once the grapes are in the cellar, nature takes over and fermentation spontaneously starts thanks to the native yeasts present in the skin of the grapes. We don’t add sulphites or any other products during vinification. We only add very little sulphite during bottling and only for specific wines during aging. For Tavel and Lirac white, this is 40-70 mg/L of total SO2. For reds, 25-60 mg/L of total SO2. Sugar is transformed into alcohol on average within 10 days. 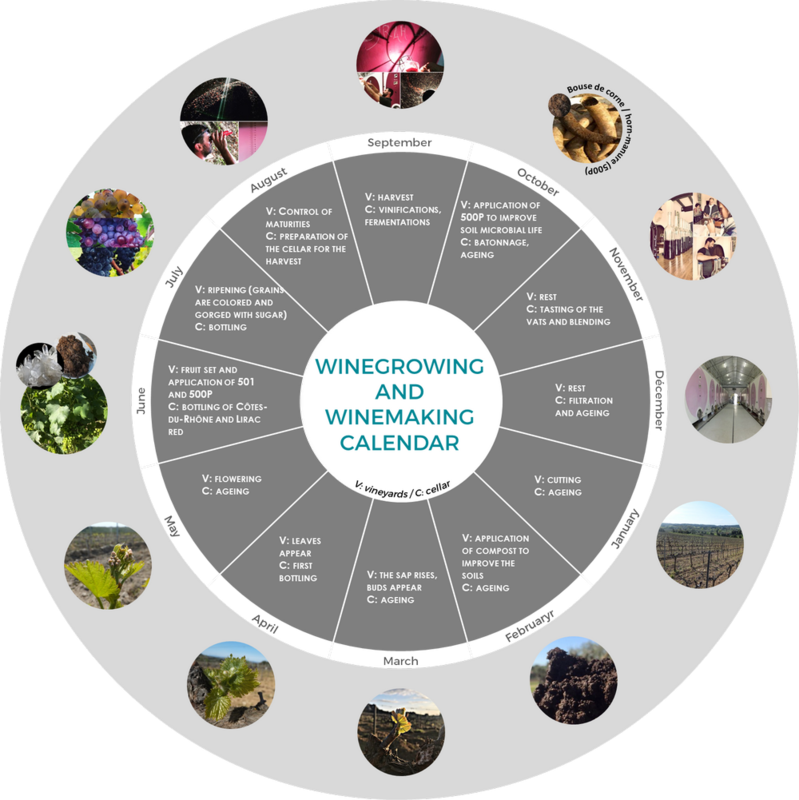 Each day, this transformation is observed and controlled by tasting, densimeter and the know-how of the wine-grower. Fermentation and aging are done in cement tanks covered in resin, which provide a better thermal inertia. Wines are less sensitive to temperature variations and are kept from all movement. Cement tanks are perfect for getting refined aromas and accenting the fruit. We don’t use wood. We want to accentuate the aromas of our varietals and highlight our terroirs through practicing biodynamic farming and natural fermentation. Aging wines can start. We start by stirring the wine, putting the lees back in contact with the liquid, to make fine wines with silky, round tannins. This month, the entire family comes together, along with our œnologist, for a blind taste test from all of our tanks and different varietals to get an idea of the vintage. After the tastings, we do the blends. This includes selecting a percentage of different varietals and their origins (terroirs) to create the nectar of our different cuvées. December is upon us! Blending our cuvées is finished. Wine is filtered to give it a beautiful brilliance and clarity. The aging and resting period begins. For several months, we regularly stir, an operation that consists of suspending the fine lees in our wines to give our wines more fruit, volume and roundness. In the cellar, new vintage bottling begins. The white Lirac and rosé Tavel are the first to be bottled, followed by the red Pays d’Oc. For the red Côtes du Rhône and Lirac, aging follows. Their bottling will take place a few months later. The time has come to bottle our red Côtes du Rhône and Lirac. The different varietals are linked together to offer an aromatic bouquet for the senses.